Robert Jenkins paints three-dimensional insects on glass. Paintings of abandoned buildings are another facet of Jenkins' art. Jenkins says he likes to capture the emptiness of decaying buildings. This tiny hornet is painted on glass. 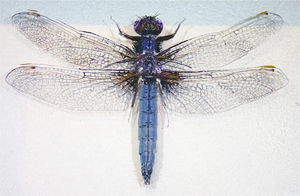 This dragonfly is created by painting on layer after layer of epoxy. Preserved in glass, the insects created by artist Robert Jenkins don't immediately demand attention. But stop a moment and get close to them, and there's a dazzling surprise. "The first time I was showing them, people were just walking by them, like, 'Oh, that's just a bug in a frame,'" Jenkins said. "Then I got to talking to one person who asked where I got the bugs. I said, 'Well, I painted them.'" The magic of Jenkins' tiny paintings is that, even when you find out how he does them, they are still astounding. During an interview in his small studio space in Chatham, Jenkins laid out several works in progress on his work table. "I start with a loose wash painting of the insect on glass," he said, "Then I do layers of a clear epoxy that hardens and then I paint on top of each layer. As the layers get thicker, it gives you a three-dimensional look." The gradual buildup of painted details finally coalesces into an insect that is rendered in a panel about a quarter of an inch thick. They are like nothing you've ever seen. "Each one takes about 40 hours, because you have to wait eight to 10 hours for each layer to dry," Jenkins explained. "And I do all the framing myself." Jenkins, 27, lives with his wife and a new black lab puppy in a home in Chatham that he is in the process of rehabbing. With a full-time job during the week, he gets only weekends to paint, but makes the most of his limited time by turning out exceptional work. Jenkins said his parents are not artistic, but they encouraged his drawing from an early age. Raised in the Coatesville area, he was inspired by the work of Andrew Wyeth, Richard Bollinger. He was also fascinated by his uncle's collection of real insects in frames that were displayed on the walls. "As a little kid, I'd always look at them, and he'd tell me where they were from and the names and stuff like that," Jenkins said. "I started doing a little more research. A couple of years ago, I got into fly-fishing and started seeing a whole lot of dragonflies on the water. I started researching them and painting them." As he went on to get a BFA at Kutztown University, and an MFA at Penn State, Jenkins refined his work from the usual barns and landscapes of Chester County to his own unique direction. "One of my buddies had access to a 3-D printer," Jenkins said. "He lived in Philly at the time and said, 'I have to show you this cool new toy.' I thought it was cool and wondered if I could apply it to art. Then there was a guy in my graduate class who uses epoxy for his paintings. I asked him how it was used, and combined the two and came up with this," Jenkins said. The shimmer of dragonfly wings, the tiny hairs on a caterpillar, or the spindly legs of a bee are meticulously rendered in life size. The paintings are a way of preserving what Jenkins sees as the beauty of the insects without having to kill them. The other focus of Jenkins' art is abandoned building interiors. "When I was younger, I'd kind of break into any place I could," he said with a grin. "I'm originally from the Coatesville-Honey Brook area. In Coatesville, they had a whole bunch of abandoned mills, Lukens Steel, places like that. Up at Kutztown, they had a bunch of old abandoned buildings as well. I'd go and walk around these places and see what I could find. "Mostly I do a quick sketch on site, and bring a camera along to photograph the light and colors I need," he said. "The hard part is getting somebody to go with me, because the buildings are steel and concrete and there's no cel service. It's not a good idea to go alone in case you get hurt." The resulting paintings find somber beauty in peeling paint, broken timbers and the rusting remnants of once-mighty machines. "I try to capture the emptiness," he said. "A lot of people think these paintings are nostalgic, but I like painting them to document the decay of the building. To show that it's a hazard, yet it's still standing. "There are people who say, 'These are beautiful places, but why do you paint them?' Other people ask, 'Who would buy them?'" Jenkins said with a chuckle. "I'm still trying to figure that out." For the past couple of years, Jenkins has displayed his work at Mala Galleria in Kennett Square, where he has gained a loyal core of admirers and buyers, particularly for his insect paintings. "It's actually kind of hard keeping up with inventory," he said. He has exhibited a piece at the Delaware Art Museum and will have a show at the Natural History Museum in Delaware this summer. His jewel-like paintings of insects should fit right in. For more information, visit www.rjenkinsart.com, or www.malagalleria.com.